With more than 10.000 m² storage space we offer possibilities for storing your goods and machines safely in storage rooms which are able to be heated. 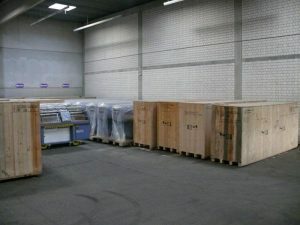 This gives the guarantee that in wintertime freezing temperatures will not influence the condition of the stored goods. 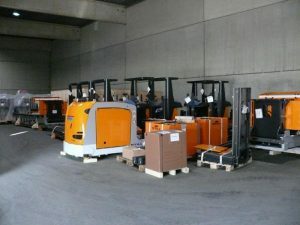 We are able to pick up your machines with our fleet all over Europe, park them in our storage rooms, and deliver them at the time you want us to do so to any place. With the help of our fork lifts we also can off-load any lorry or any container and can take the goods into our storage space.